For customers who need or want to avoid gluten we produce a gluten-free version of our classic gnocchi, based on corn semolina and potatoes. Internal and external analyses ensure a continuously proper quality. The gluten-free gnocchi can be recognized by the yellow label. Our organic pasta is exclusively produced in Germany, of course keeping to original Italian family recipes. To minimise our carbon footprint, we avoid long transport routes and produce as ressource-efficient and sustainable as possible. 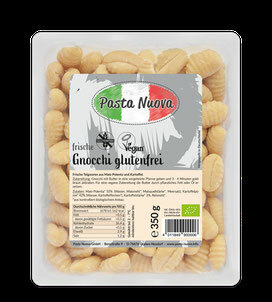 In our product range we offer vegetarian, vegan as well as gluten-free pasta.